Let's talk meal prep basics! It is, truly, NOT as complicated, time consuming, expensive, etc. as you may think. I personally want to spend the least amount of time as possible, and the least amount of money meal prepping, while still eating real, whole foods and being in optimal health, which is what I hear many of you reiterate! In college and in grad school, I had, maybe 5 minutes to put something together, and that was on a good day. So I do, truly hear where you're coming from. Here are the basics, what I think is good to stock up on, what you really need when "push comes to shove", etc. Many of the foods should last for a long time. It's TOO STRESSFUL to feel like there's so much fresh food in the fridge (or mini-fridge) that you have to eat asap. This way, you can truly choose what you WANT to eat, WHEN you feel like it. For these reasons, I highly stress finding good, wholesome food for the pantry and freezer that's non-perishable. Frozen non-starchy vegetables, such as spinach, broccoli, cauliflower, etc. Frozen proteins such as turkey burger and regular burger patties, shrimp, fish filets, etc. Some fresh vegetables each week are nice to have - they give you more options when cooking! I recommend prepping on Sundays and Tuesday or Wednesday nights. This way, you don't have to eat the same food every darn day! Focus on prepping proteins (e.g. cooking chicken breasts) and cutting up veggies during these Sunday & Tuesday/ Wednesday meal prep times so that you can quickly throw things together at night or in the morning. Choose 2 proteins and 2 non-starchy vegetables for each week (in addition to a lettuce-type veg if you're making a salad) to mix & match throughout the week for easy prep. Again, it's 100% ok to use frozen proteins and veggies. This has to be doable for YOU. Use different low-calorie seasonings and dressings to spice up your meals and make them different each day. Trader Joe's Everything But the Bagel seasoning is excellent, as are a few of their salad dressings. Keep some of these at work or at an easily accessible location (maybe your department!) at school. In no way do I pretend to be an excellent cook. I learn so much from the internet... and I of course call my mom in a panic semi-frequently. Here are some great, basic guides. 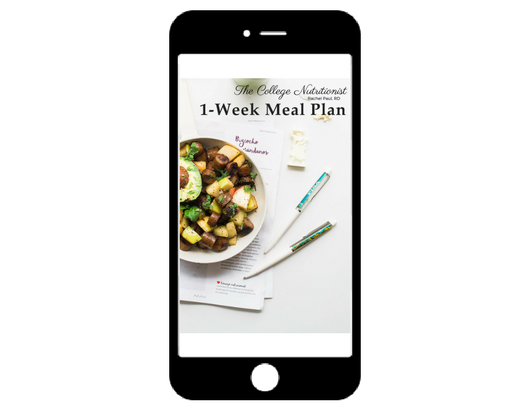 Check out the blog posts below for lots more good info and meal plans! 1500 Calorie Low Carb, High Protein Meal Plan with Pumpkin Carrot "Noodles"
Which Fats Should I Eat?